Mix cream cheese, sweetened condensed milk, and whipped topping together in a bowl until smooth. 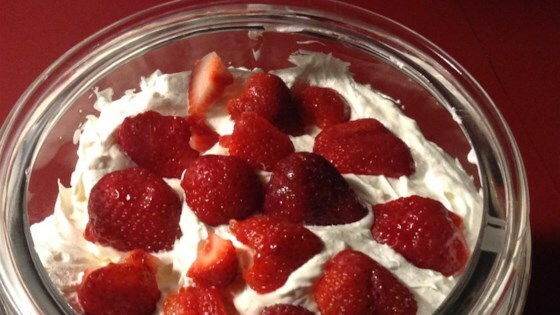 Sprinkle a layer of angel food cake cubes in a large glass bowl; top with a layer of strawberries. Spread a cream cheese mixture layer atop strawberries. Repeat layers with remaining ingredients. Chill in refrigerator for 30 minutes to 1 hour before serving. Berries and cream bake up like a dream! A big hit for Father's Day brunch. I made this for Easter & everyone LOVED it! Tastes DELICIOUS!!!! I will make again! I made it for a party at work and everyone loved it. I made it exactly like the recipe. Quick and easy! I made this exactly as the recipe stated. I took it to an Easter potluck and everyone loved it. More than one person had seconds. It's easy and looks great too! I will definitely make it again. I used Entemanns Pound cake ;-) I made 1 with vodka strawberries and 1 without. I took it to a square dance party and it was a hit. There was none left to take home. I made it just the way the recipe was listed. I am making it again for Mothers Day dinner.